Hiya guys! Is it me or does it feel like the months are moving by so quickly? At least summer seems to have flown by in the blink of an eye and I'm not complaining. It's really not my favorite season and I tend to thrive during the Fall and Winter months. Especially when it comes to nail polish, at this time of year your girl is looking for more than just neons. Thankfully this is the perfect post to get me out of that summer nail funk. 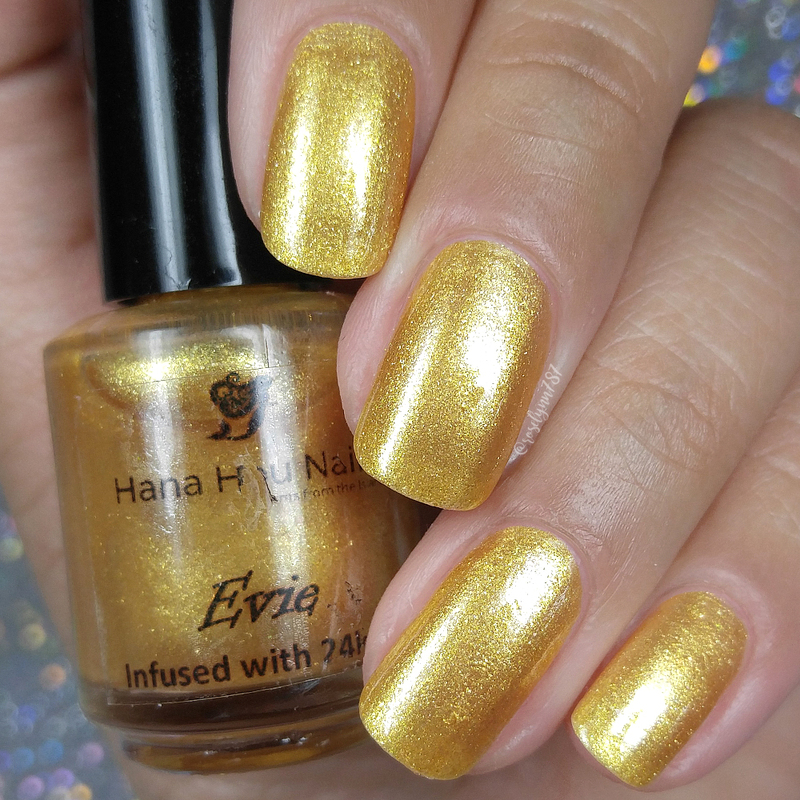 Today I'm sharing swatches for a few shades in a variety of from a new-to-me brand Hana Hou Nails. I believe this brand is pretty new in general so it's double as exciting to be able to give these shades a try. There is a cute twist to the shop as mostly all the polish comes with the option to be scented. I haven't seen this done too often and not in a long time actually so I'll talk about that with each polish. Now let's go ahead and get right into the swatches! All these shades by Hana Hou Nails and many more are now available for purchase. Polishes are available in full and mini sizes and some come in scented options as well. There is also free (US) shipping available on any order over $10. Evie can be described as a bright gold shimmer polish that is infused with real 24k gold. It comes with the option to be scented in a brown sugar fragrance, which I don't believe mine was. At least I did not pick up on the scent during my swatch-fest. That aside, I have to say this is probably one of my favorite shades from the four I was sent. Definitely did not expect for that to happen as I tend to shy away from gold as they typically don't mesh well against my skin-tone. This was not the case here and the hue ended up looking incredible against my complexion whilst giving me the perfect glow. I absolutely love it and can see myself wearing it over and over again no matter the occasion or season. Needless to say it has a big stamp of approval from me and is a must-have. The formula has a sheer application that builds-up to almost a complete full coverage. There was a bit of a visible nail line in person, but I didn't feel like it was noticeable at all in photos. It's one of those things where it only becomes obvious if you're looking for it specifically. The consistency was very well balanced throughout the coating, not too thick or too thin. Super easy to work with and layer. It dries down to a minimal gritty finish but ends up smoothing out perfectly after topcoat. Shown in three coats and sealed with a glossy topcoat. Abalone can be described as a white chrome finish with a red, green and gold shimmer. This shade comes with the option of being scented with honeysuckle smell. For this polish I definitely picked up on the scent, but it was very subtle in comparison to just the natural smell of nail polish. I actually preferred it that way because it made the smells easy to handle as they weren't competing with each other. The polish itself also ended up surprising me because it's again not a hue I tend to naturally gravitate to. It ended up looking so good against my skin-complexion and was pretty unique in my collection. Again I just think that's because this polish is not something I would normally be drawn to. 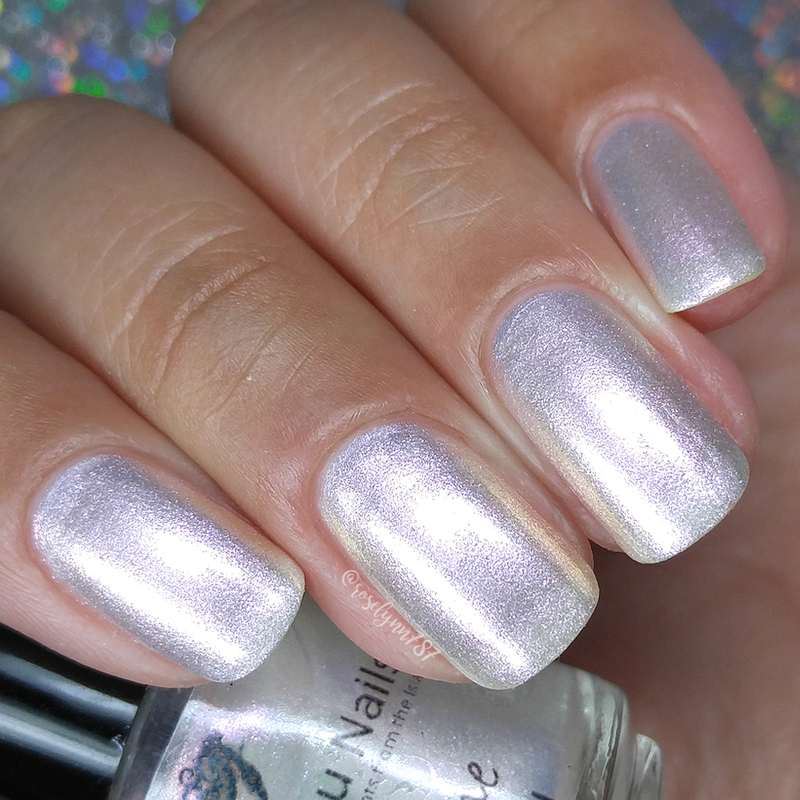 The formula has a sheer enough application that this could easily double as a topper over any base. But it does also build-up extremely well for almost complete coverage. There was a minimal visible nail line, but again it's only really noticeable if you are looking for it. Very similar in Evie in application and vibe. Consistency is perfectly balanced, not too thick or too thin. It dries down to a gritty finish that smooths out after topcoat. I also noticed some minimal visible brush strokes in the finish, but it mostly blends out as it dries. Shown in two to three coats and sealed with a glossy topcoat. 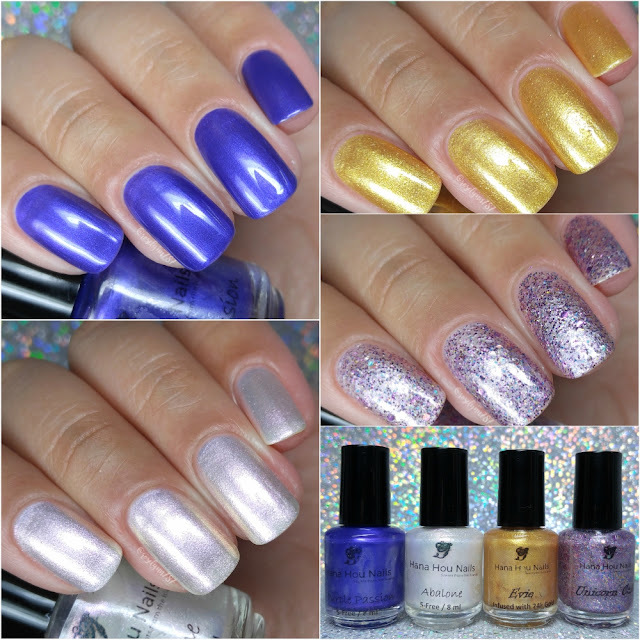 Unicorn Cafe can be described as a light pink glitter bomb filled with dark purple, bright pink, blue, and yellow glitters. This shade comes with the option of being scented with a hot chocolate smell. Unfortunately for as good as that sounded in theory, I really didn't like the smell in person. I tend to be a little sensitive to certain scents and this one just didn't seem to agree with me. That said, this particular polish was my least favorite among the four I tried out. I'm usually a fan of glitter bombs, but this one felt like it had a little too much going on in the finish. It ended up coming off too busy and cluttered with the colors not blending well with the shimmer in my opinion. 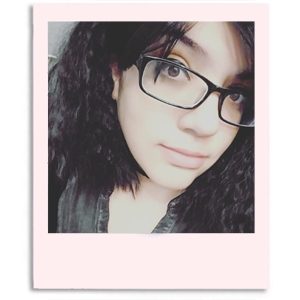 The light pink was also not my favorite against my skin-complexion and brought out too much warmth. The formula has a sheer application that builds-up to almost complete coverage. Like the previous shade, the base was so light that I feel like this could be used as a topper as well. The consistency leans on the thick side and makes layering a bit of a challenge. Although it was manageable enough during this swatch session, for future uses I can see it needing some thinner. It dries down extremely textured, but ends up smoothing out by doubling up on the topcoat. Shown in three coats and sealed with a glossy topcoat. Purple Passion can be described as a vibrant purple shimmer with touches of red and blue throughout. It comes with the option to be scented with the perfect passion-fruit smell. And we are closing out the review with another favorite of mine and a definite must-have for purple lovers. The scent felt perfect for the shade (especially for the namesake) and wasn't overwhelming whatsoever. The color is very punchy and in your face without being too overwhelmingly bright. It's a unique tone in my collection and looks great against any skin complexion. The formula has a sheer application that builds-up easily for full coverage. There is a great smooth build-up throughout and was super easy to work with. Consistency was on par with the majority of the others and felt well balanced. It dries down to a smooth and high-shine finish on its own, but I did add some additional topcoat for the swatches. There are minimal brush strokes visible in the finish, but they tend to mostly blend out as it dries. I'd also like to note that I experienced no staining on removal to either my cuticles or nail beds. Shown in three coats and sealed with a glossy topcoat. To recap, all these shades by Hana Hou Nails and many more are now available for purchase. Polishes are available in full and mini sizes and some come in scented options as well. There is also free (US) shipping available on any order over $10.